There is little sign of real progress in discussions between NBA owners and players as the latter are issued with a midweek deadline. NBA COMMISSIONER DAVID Stern has given players an offer and a deadline: Accept a chance to earn up to 51 percent of basketball-related income by Wednesday or get ready for a deal that’s a whole lot worse. He wouldn’t call it an ultimatum, but it didn’t sure sit well with the union. “The players will not be intimidated,” attorney Jeffrey Kessler said early on Sunday after eight hours of negotiations stretched late into the night. “They want to play, they want a season, but they are not going to sacrifice the future of all NBA players under these types of threats of intimidation. Thus ended another frustrating day, one that puts a lengthy 2011-12 season in doubt. “(It) was another sad day for our fans, for arena workers, our parking lot attendants, our vendors. Very frustrating, sad day,” union president Fisher admitted. Players and owners met with federal mediator George Cohen for more than eight hours, and Stern said Cohen offered six “what if?” recommendations relating to the BRI split and the salary cap system. Stern said owners accepted the first five and would put them in writing in a formal proposal to the players, hopefully Sunday. 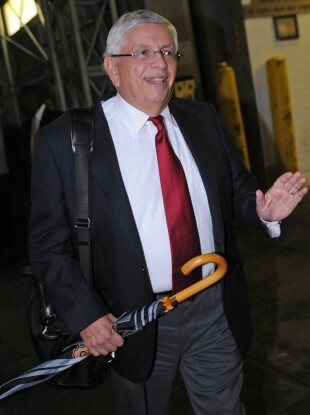 But it wasn’t acceptable Saturday, with Stern saying Kessler rejected it. “I think it’s fair to say that speaking on behalf of the union, Mr. Kessler rejected the mediators’ recommendations and our proposal,” Stern said. Day 128 of the lockout came at the end of a tenuous week in which both sides seemed as much at odds with themselves as each other. A month of the season already has been lost, and more games could be in jeopardy soon and if they can’t agree to one by Wednesday, it will be even harder to find common ground as players already rejected a flex cap in June. Fisher and Kessler again questioned the owners’ willingness to negotiate, but Stern said they were ready to make a deal — by Wednesday. Email “Wednesday deadline issued as NBA talks continue”. Feedback on “Wednesday deadline issued as NBA talks continue”.